Michael Rohana was attending a Christmas-themed ugly jumper party at the Franklin Institute in December 2017 when he entered a closed exhibit of ancient Chinese terracotta warrior statues. 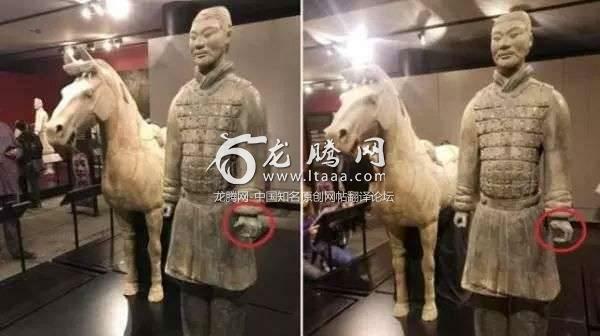 Authorities said Rohana, 25, took photos while posing next to a statue known as “The Cavalryman”, then removed the valuable relic’s left thumb and made off with it. The incident was captured by surveillance cameras. A mistrial was declared. Federal prosecutors said they’ll decide by May whether to retry the case. Americunt have no respect for Chinese at all,but they claim they have human rights and freedom.what a joke. Philadelphia is the Sin and the theft city. We have become a terrible country full of low class people. To the Chinese these warriors are precious and to Africans their elephants and Rhino are precious it’s a matter of lack of respect, damage and theft in the first instance and a matter of greed, arrogance cruelty and genocide in the second instance. Disgusting yes but do you remember a boy called Ding Jinhao? He was the Chinese tourist who carved “Ding Jinhao was here” into the wall of a 3000 year old site in Luxor Egypt. Point is these kinds of acts are not just confined to Americans are they! Do you remember the European robbers? Go to every museum in Europe and USA, and you will know who is the robber, and then you should be ashamed of all of yourself. Ten years later, the supreme court of justice sentence the man to death penalty! franklin museum must pay up. Only the bronze chariot and horse is replicas due to its quantity, everything else is 100% real. I see. Terrible human behaviour! Who the hell cares ? As the exhibits are uninsurable they have to be under written by the government of the country hosting them. Which means the American taxpayer will end up paying for this idiot’s lack of respect and stupidity. It was made in China, which means it will break again in six months. But it lasted 2000 years until some purposely, I assume, broke it.